Visit our Birth Announcements page to see our newest kittens for sale! Visit Tique Times Blog for our latest news!! extraordinary, unique, and individually meaningful experience. It is our privilege and pleasure to share this experience with each of you and your families. become a treasured member of your family. companion and a graceful and charming addition to your family. They will bring love, warmth, and especially fun to your days! We'll give you a brief description of the breeds of kittens for sale found at Boutique Kittens. "Tique Tracks" shared with us by our kitty clients. Our traditional, or Doll Face Persians are prized for their elegant full coats, expressive pansy-like faces, and gorgeous round eyes. This ancient and regal Persian breed is well-known as the most popular breed in the country. It is our hope that one of our Persian Bou Baby kittens for sale will become a loving addition to your home. 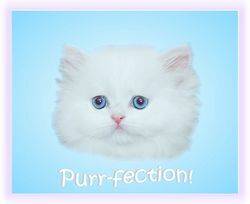 Picture the stately beauty of our blue eyed white Persian:this is the purr-fection that we strive for! Our ever popular Doll Face Himalayan kittens for sale are known for their dramatic colorpoints which so gracefully emphasize each of their features - from their nose to their toes! The Himalayan breed originated from crossing the Persian with the Siamese, so these kittens for sale get their friendly and affectionate side from their Persian ancestors and their mischievous playfulness from their Siamese heritage. 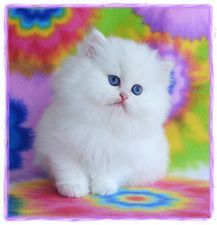 Toy and Teacup Persians and Himalayans have become increasingly popular. Persians and Himalayans for sale. Toy and Teacup Persians and Himalayans are small in size and big in personality! Since 1971 Persians have been the most popular cat breed. 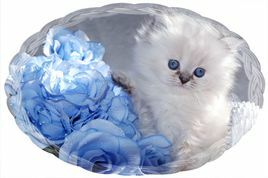 Our Toy and Teacup Persians and Himalayans help us meet the ever growing desire of families to have small pets. Quiet and relaxed by nature, these little kitties make wonderful family companions and great City Kitties! ensure the safety and health of each of our cats and kittens. for all kittens. Details are set forth within our guarantee. surround them each day they spend in our nursery! they would be a welcome addition to your family! Let us know if we can help you find the kitty of your dreams.